The original commission aimed for a fishermen facility made of 20 workshops. 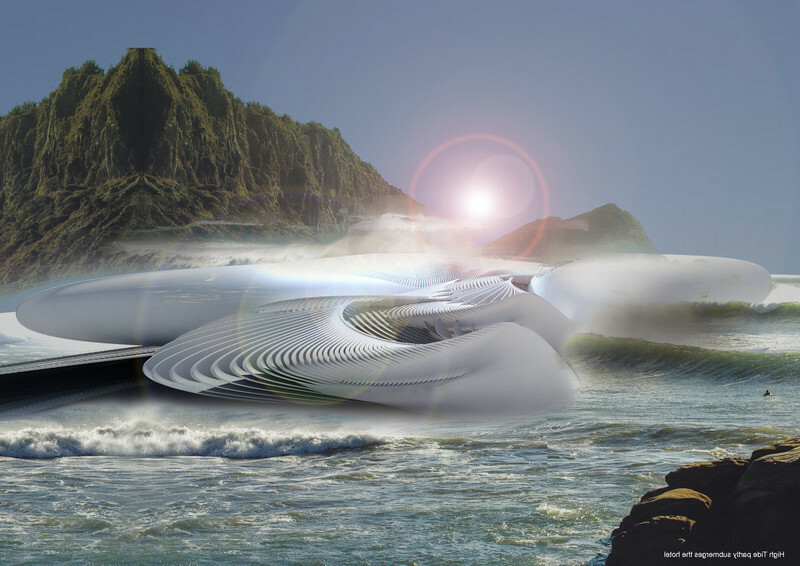 But after in-depth analysis of the site, its history, and the municipality needs; BuzzoSpinelli Architecture proposed to enhance the program by adding a sales area and an urban space. Following their lead, the general contractor wished to complete this program with an office for the fisherman, another one for the SNSM, and a community hall. Exchanges of views between both parties gave birth to the final project. 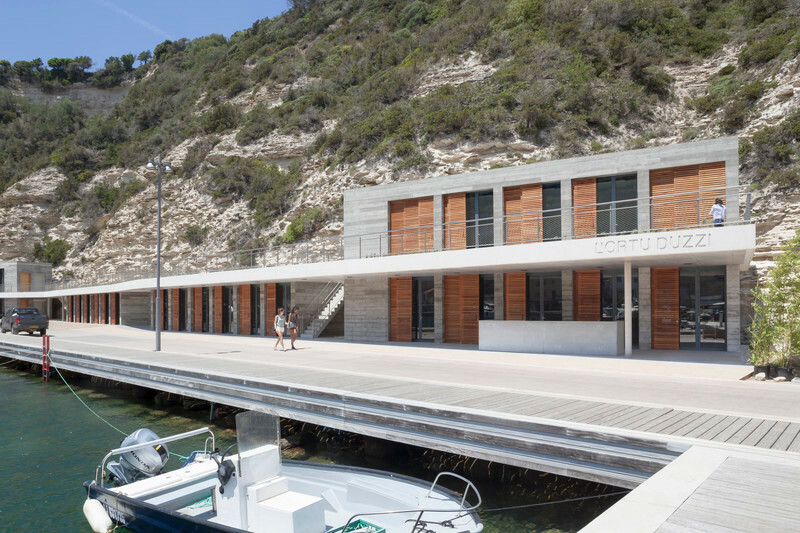 More than just a facility for fishermen, L'OrtuDuzzi project added a new chapter to Bonifacio's story with its material and its endemic gardens. Terms: Complete mission, MOP, OPC and SYN regulations, listed site, ZPPAUP, building permits with ministerial approval. 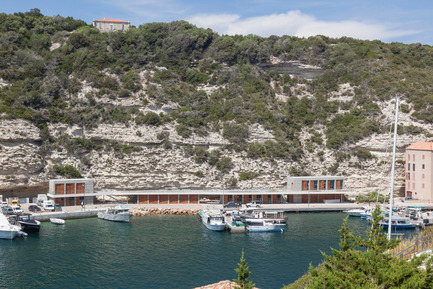 Named after its location; L'OrtuDuzzi, in Bonifacian “Gardens where the fresh water runs”, is the chosen site for the fishermen to carry on with the tale of their city. Those gardens with their spring water, ideal for vegetation, reveal a peaceful place to pass on ancestral skills. 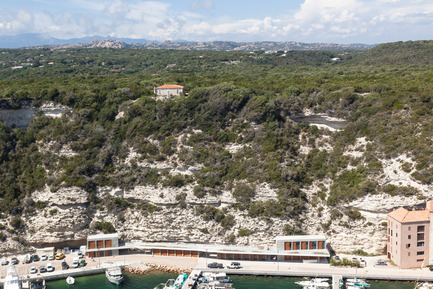 Nesting at the foot of a limestone cliff, dreaming of an open space, the fishermen corporation hold decided to dive into the port reminding us that Bonifacio belongs to the sea. The building moulds the cliff and spreads all along the plot. 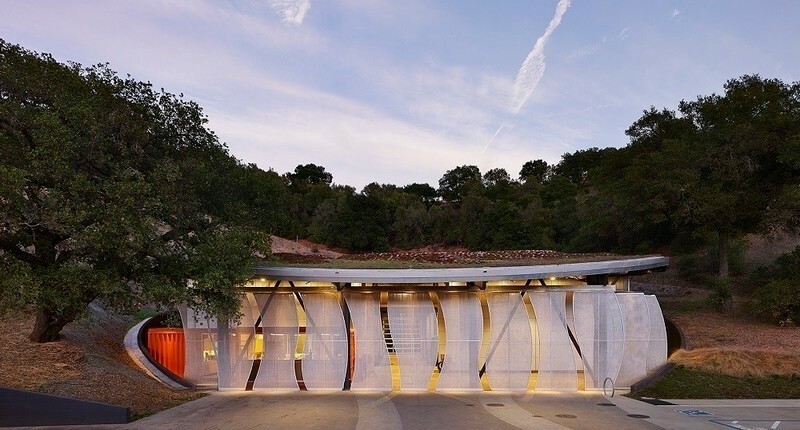 It embraces the whole area generating an urban project as well as an architectural one. 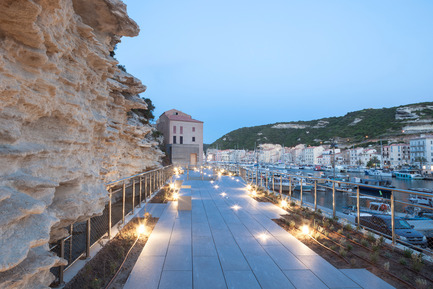 And because it is standing against the cliff, the fishermen's corporation offers a large esplanade connected to the building itself through designed outdoors areas. In this way, net repairs, auction sales, and fishermen's work occupy the shore bringing back to life these -once wild- practices. 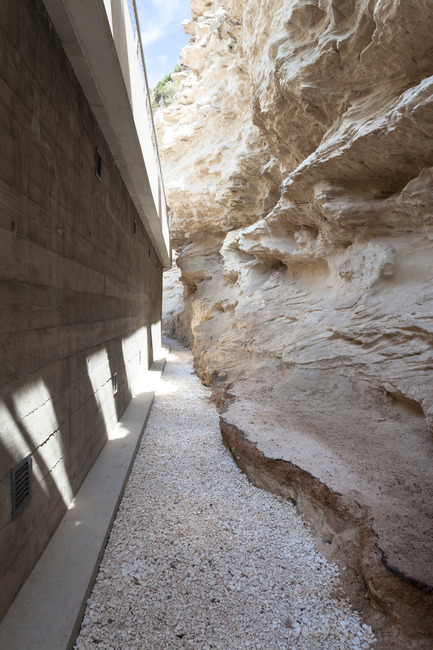 Wrapped by the beautiful mineralogy of the area, the construction is intended to be rough in its context. The choice of the cast concrete carries proudly the scares of the process. 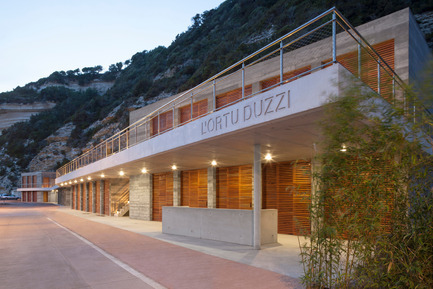 These concrete horizontal imprints, together with the sliding shutters lines echo the limestone strata behind them. The sun shades made of horizontal wooden slates animate the building's elevation giving a kinetic effect as well as deck look. A white concrete acroterion stands out from the background creating shadow for the fishermen and reminding the headland of the city. The first floor is designed like a belvedere where bonifacian plant species take over the terrace creating a charming space for fellowship and sharing. Materials: Cast concrete, white cement, Niangon wood (used for naval constructions), and metalwork in thermo-lacquered steel. 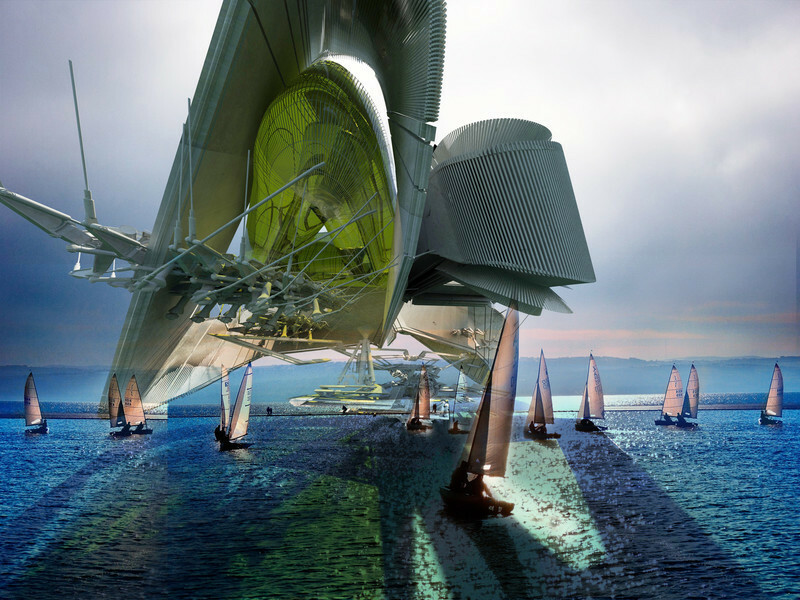 BuzzoSpinelli Architecture is a young architecture practise created in 2014 by Isabelle Buzzo and Jean-Philippe Spinelli, both ENSA graduates - Ecole Nationale Supérieure d'Architecture in Marseille. 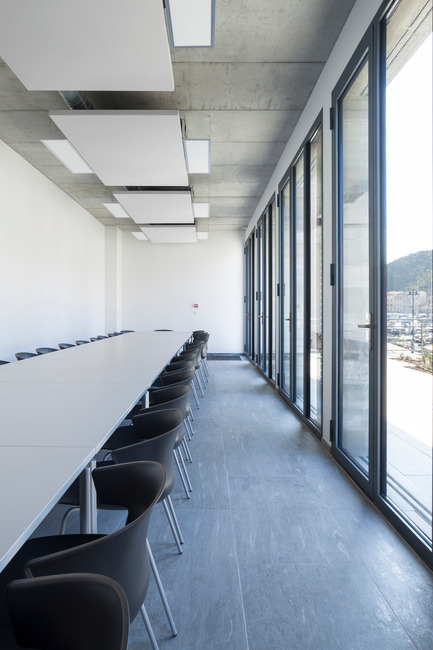 Working in Paris and in Bonifacio, the architects have chosen to juggle between the great concert of the city and the wild silence of the island. 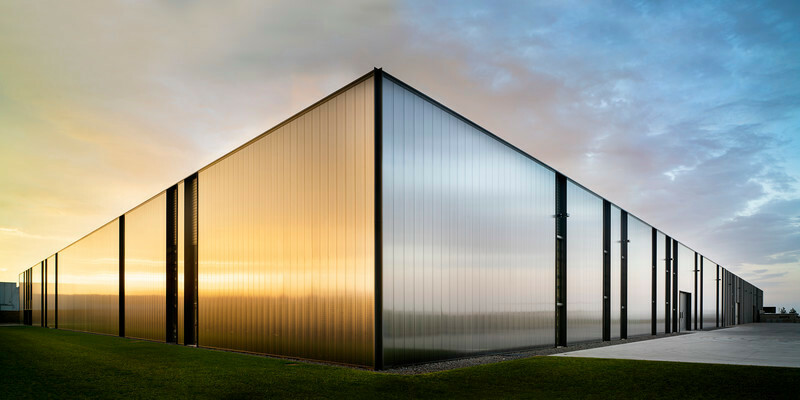 Embracing architecture, urbanism, and landscaping, the studio's works and projects scales are well-diversified. 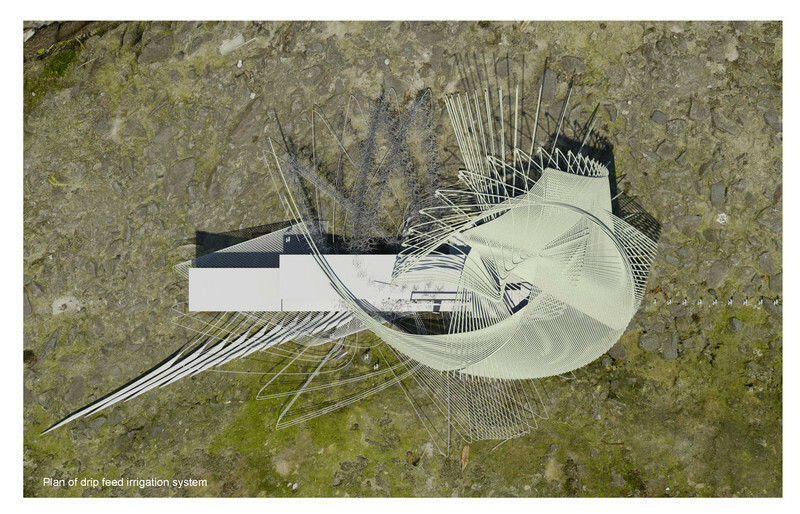 Their approach offers each project a solution resulting from a personal and sensitive commitment to a given context. 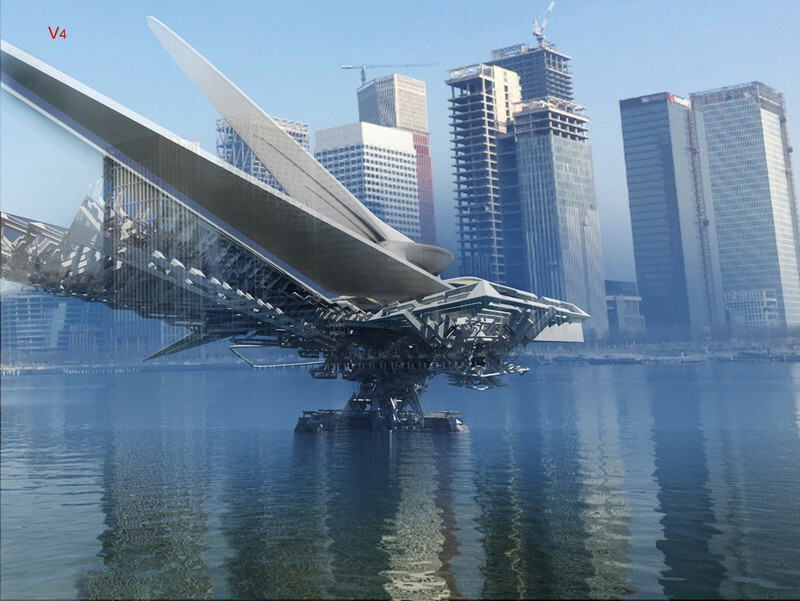 The architects' practice of architecture is animated by a will to touch. 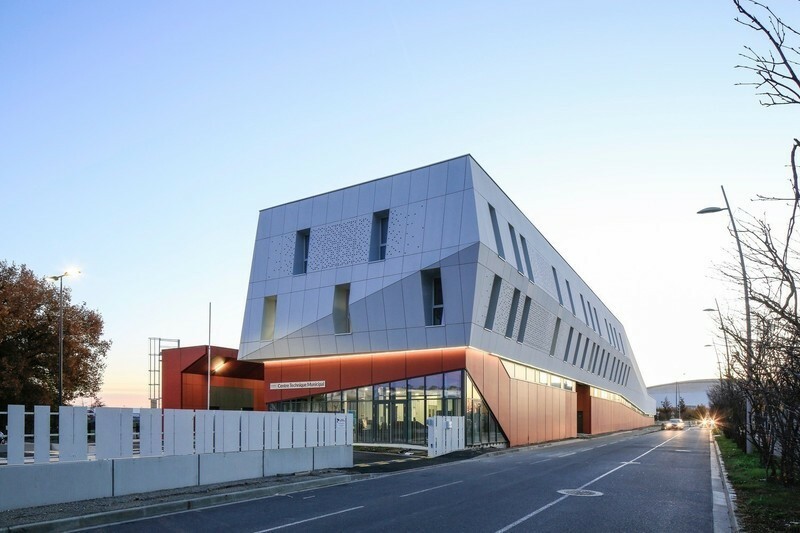 Since 2016, the studio has been awarded the Albums des Jeunes Architectes et des Paysagistes price- AJAP, it has been nominated for the Equerre d'Argent price - first artwork category, and finally it has been laureate of the Archi Design Club Awards - Activity & Industry category. Ripped off the cliff, limestone pieces have chosen to dive into the port. The building following the cliff's curves and spreading all along the parcel. Widely open on the docks, workhouses offer to public the display of fishermen's work. 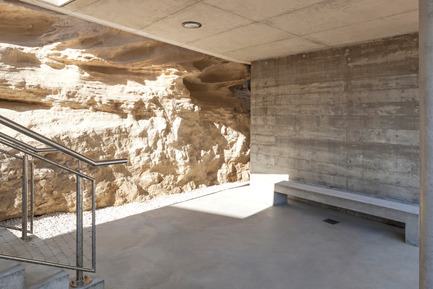 Surrounded by minerality, the construction is meant to be rough. Acoustic panels dressing up the concrete under cover and joineries of steel opening on the belvedere. The building and the cliff encounter and offer to touch. 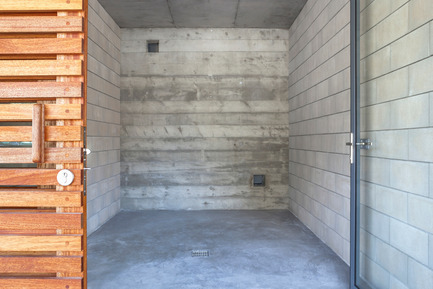 Imprints in the concrete vibrate with the sun-breaker slats. 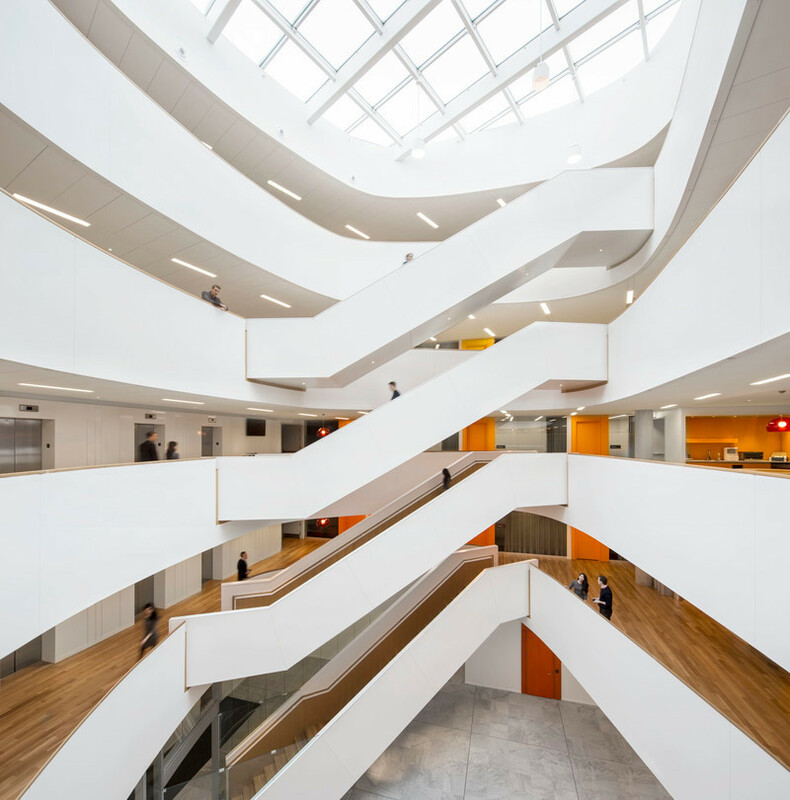 The Fishermen's Corporation open to the city life with public spaces within its building. 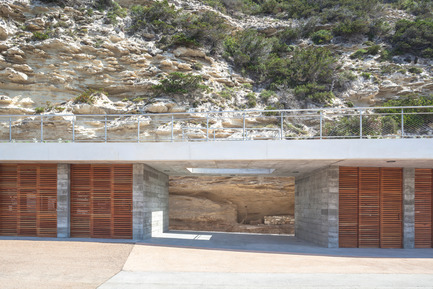 Interstices creating public space reveal the limestone cliff background. White concrete acroterion stand out against the background with its whiteness and bring depth to the project.